This morning was the last scheduled morning of banding for the Avian Outreach class. Despite some low expectations with the weather and lack of recent migration, the variety and numbers were quite incredible. We ended the day with 77 birds of 18 species. 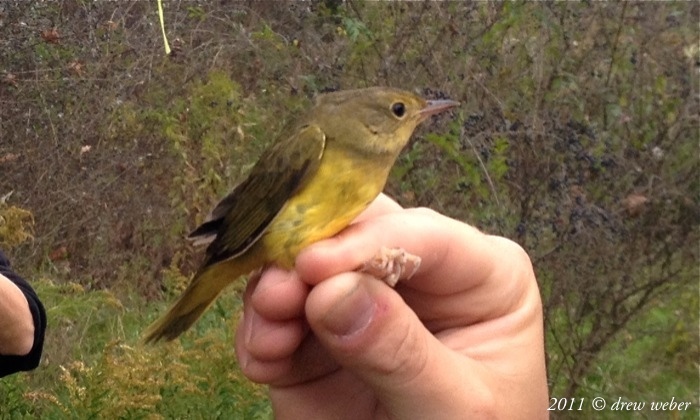 The first really exciting bird for most of us was a first fall female Mourning Warbler. The Mourning Warbler didn’t initially seem to have many obvious field marks to latch onto other than the huge bill and bright yellowish underparts. Upon closer inspection we could see the faint grayish-brown hood and the (almost complete) eye-ring. 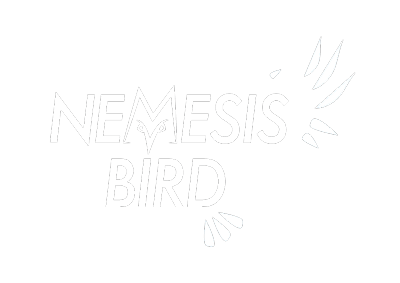 The whole bird was a beautiful yellowish color with fresh looking feathers. You can see a contrast in color between the primary coverts (by the thumb) and the greater coverts (larger feathers to the right of the primary coverts) which helped to age it as a first fall female. For more information on ageing Mourning Warblers, check out the photo guide at McGill Bird Observatory. 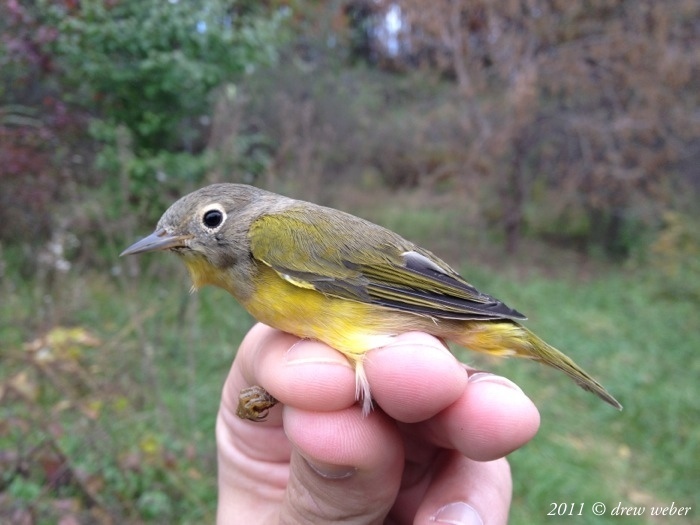 It was nice to compare this bird to the Connecticut Warbler we caught earlier in the season. 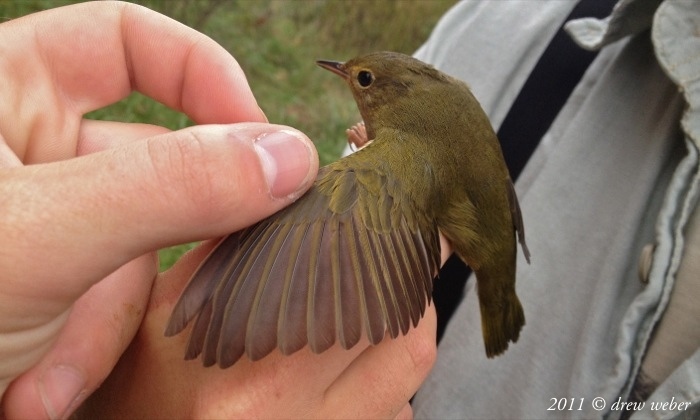 Not long after that, one of the students brought in an Orange-crowned Warbler, which I somehow didn’t manage to get a good photo of in the excitement. On one of the last nets checks that I was around for, I walked up to the net ready to pull out one of the 21 White-throated Sparrows. As I reached out to get it out of the net, a small warbler slipped out of the net and flew right into the neighboring net. Forgetting about the sparrow, I quickly went over to the other net to get the warbler before it got out again and found a beautiful Nashville Warbler. Before the day was over, we added two more warbler species to our list – Yellow-rumped Warblers and a western Palm Warbler. It was also a good day for sparrows with 5 species. In addition, kinglets were all around, although we only caught Ruby-crowned Kinglets. The complete list is below.